I recently saw bluebirds in the desert for the first time. If not for the zoom on my camera, I probably wouldn't have been able to identify them. They're quite shy. They feed on the berries of desert mistletoe, those reddish clumps hanging from the trees. I started seeing them in December. 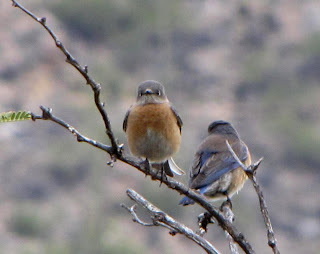 Western Bluebirds are year-round residents of northern Arizona, however I understand that here in the southeast, they're just visiting for the winter. Males have blue coloring where females are gray. Both have chestnut colored breasts. I will enjoy the watching the bluebirds while they're in the area. Do you ever see bluebirds where you live? Pretty! I'm going to be on the lookout, thanks. Nice captures. I don't see them here but watch them all summer at the North Rim. Oh my goodness, they are so beautiful, and the colors on these birds are just so dreamy! Wow, these are great shots! They are so precious! Congratulations to your daughter, and I am a May baby too! Diane, thanks for our friendship in blogging, your comments serve as an inspiration to my posts! Fantastic find and photos Diane. I saw some at Patagonia last year and was so excited to see them. They are so pretty. Awww, Diane, my heart did little flipflops when I saw these photos. I love their fat, round little bodies and the blends of blue/brown to help them mix in with the desert landscape. We don't have bluebirds in our area at all; blue jays but no bluebirds. they are superb ! thanks a lot fr sharing them. The Western bluebirds are beautiful. I would love to see them someday. 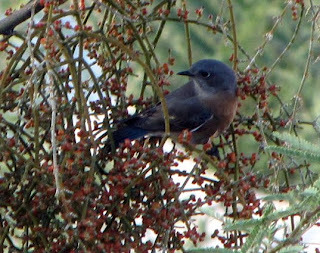 I have seen the Eastern Bluebirds in my yard and the Mountain Bluebirds in Yellowstone. 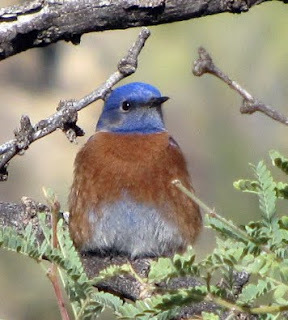 I have yet to see these pretty Western Bluebirds. Your photos are wonderful. These are wonderful captures of the bluebirds. They are such a pretty bird. I have never seen them in our neck of the Sonoran Desert, though there is mistletoe growing in our neighbor's tree. Will have to watch for them. We have bluebirds here in Central Indiana and I occasionally see them in January, which totally surprises me. wow, those are very beaitiful Diane, your pictures are so crisp and vivid that I can almost feel the expression of birds. You got great shots of the birds! How did you get so close?! They are precious and I love seeing them. I have had the occasion to see a few here in California. I even was able to capture a shot of one though not nearly as well as you have. Stine - I couldn't even get close enough to see what color they were with my eyes, but 20X zoom on my point-and-shoot helped a lot. I have not seen one before,they are beautiful. Thanks for sharing, I know another bird in m dictionary. That's a great capture, Diane! And I love the contrast of blue and brown! Wow...such lovely birds. Good capture, so clear! You're such a talented photographer, Diane! Beautiful birds, Diane. Ours have come back to the feeders this week (now that it is so cold here)... I have some new pictures also--which I will post this week. BUT--I love seeing yours out there in Arizona. Those bluebirds are cute ;-) Good to see them having 'friends'/company (other birds) and you as well! I just saw the news about your daughter. Congrats Grandma!! :) Is this going to be your first grandchild Diane? I've never seen bluebirds. They are really pretty. Joan - Thanks, yes this will be my first grandchild and I'm so excited! I liked the pics. I have never seen such a beutiful and lovely pair. Nice addition to the Arizona color palette! Where? Where? No sign of any here. Lots and lots of hummingbirds. I will keep my eyes peeled, but where did you find them? Such great shots, thank you! The birds with blue colored heads looks nice.I like the photos with different views of the bird. 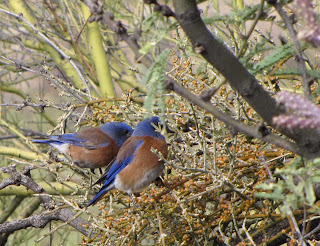 Brenda, the bluebirds were at Sabino Canyon, north of Tucson. Great captures, Diane. I, too, use the telephoto to assist me in identifying birds. Excellent captures of the beautiful little bluebirds. I never see them here but maybe I just need to use my telephoto a little more. Happy New year, Diane. 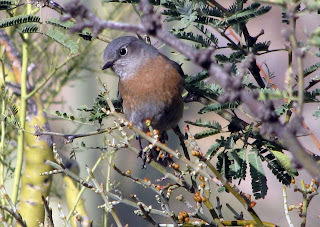 Bluebirds are often seen in Bermuda. In the distance, it is sometimes easy to miss them - but when they fly away, the blueness is unmistakable and gives them away. It's been very windy lately on the island and I have not seen one in quite some time. 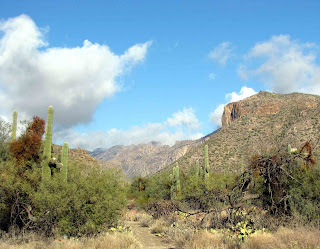 The guided birdwalks out at Boyce Thompson are fabulous for bird watchers, too. I love birds, especially colorful ones. I don't get to see them except in the local pet store. Nice to see your pictures. These blue birds are beautiful as well as cute. Such beautiful and amazing captures! No Diane, I've never seen a blue bird :( But your pictures made me see them :) Really good takes. All your recent posts are lovely! Great pictures of the Blue Birds! We live in the East and I only see our Blue Birds passing through in the Spring. Unfortunately, they never hang around long. What gorgeous pictures! I don't think that I've ever seen them. 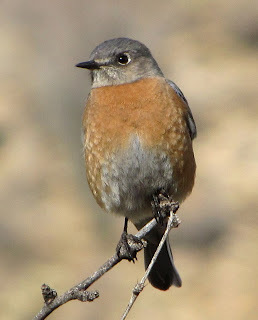 I saw a flock of 8 to 10 western bluebirds at the Desert Museum today. The bird has such beautiful color, and my favorite is the second photo from the last..The whole composition is outstanding! They are so beautiful, you are lucky to see them at least part of the year. I never see any bluebirds in our area. Great photos, you have an excellent telephoto.